PCARA Productions’ heart hitting, soul stirring, electrifying, and crying hilariously, gospel stage play, “Too Blessed To Be Stressed!” will be one of the most talked about gospel stage plays in history. “Too Blessed To Be Stressed!” is destined to capture your heart and widen your eyes to those who seek God’s promises. This gospel stage play realistically depicts the life of Robert-Lee Earl-Ray Dully. He is a God fearing man, who is filled with joy, happiness and the Holy Spirit. Robert-Lee lets it be known to all he comes into contact with that he is too blessed to be stressed. This awesome, theatrical production is simply about having complete faith in God’s promises. 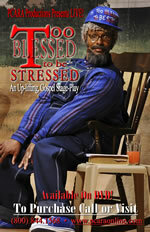 “Too Blessed To Be Stressed!” is enjoyable for the entire family to see.